THE MIGHTY MONO ‘LEOPARD’ RACES ROUND THE ISLAND BUT DOESN’T BEAT ITS OWN RECORD! Mike Slade’s 100ft Leopard has taken line honours in the monohull fleet, finishing at 1140 in a time of 4hrs 40 mins 34 secs which is just under an hour outside their own record, while the next two monohulls – the Open 60 Artemis and Tony Langley’s TP52 Gladiator B – were around five miles from the finish at midday. With this edition of the race tipped by a number of experts as being one that will favour the smaller boats on corrected time, these early finishers now face a long wait before their overall position on corrected time is known. Conditions on the water remain perfect for the 1,584 boats competing in the race – there’s almost unbroken sun and a west south-westerly breeze of 12-15 knots, with gusts to 20 knots. 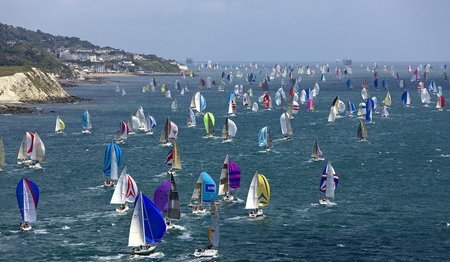 The bulk of the fleet is now stretched out along the southern shore of the Isle of Wight, with an estimated 1400 boats between the Needles and Bembridge Ledge, making a wonderful sight both for competitors and for those watching from on shore.